When it comes to Italian cuisine we can easily get stuck in a red sauce rut. Don’t get us wrong, we love our meaty marinaras, but sometimes it’s nice to mix things up. 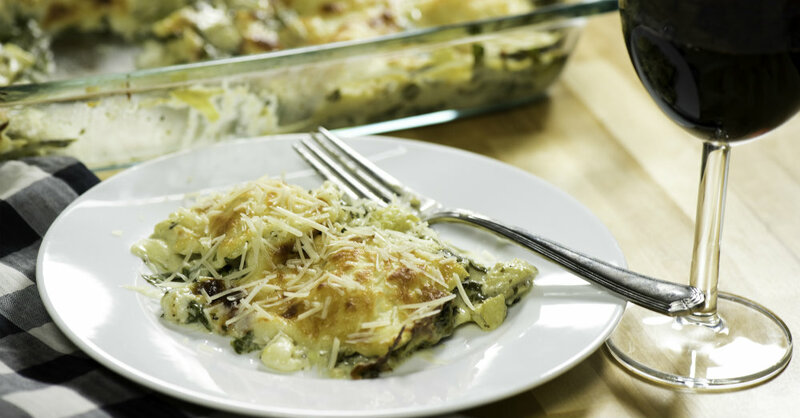 Our Spinach & Artichoke Ravioli Casserole is the perfect way to branch out and try creamier Italian fare. Loaded with herby pesto, luscious Alfredo, fluffy pasta pillows, and gooey cheese, this dish is bursting with scrumptious flavors. It’s simple enough for weeknight dinners, yet elegant enough for special occasions. And with all this deliciousness our kids didn’t even fuss about spinach in their dinner, which is always a win! Try this casserole the next time you’re craving pasta, we know you’ll be hooked! In a medium bowl, toss together spinach and artichokes with pesto sauce until coated. Stir together Alfredo sauce and chicken broth in a separate bowl. Spread 1/3 Alfredo sauce mixture along the bottom of a 9x13-inch baking dish, then top with 1/2 spinach mixture. Layer half of ravioli evenly over spinach, then top with another layer of Alfredo sauce and spinach. Top with remaining ravioli, then cover with remaining Alfredo sauce and Italian cheese blend. Cover with foil, place baking dish in oven and bake for 15 minutes, then uncover and bake for another 15-20 minutes, or until cheese is melted and bubbly.